Francis William Newman (June 27, 1805 – October 7, 1897), the younger brother of Cardinal Newman, was an English scholar and miscellaneous writer. Born in London, he was, like his brother, educated at Ealing, and subsequently at Oxford, where he had a brilliant career, obtaining a double first class in 1826. He was elected fellow of Balliol in the same year. 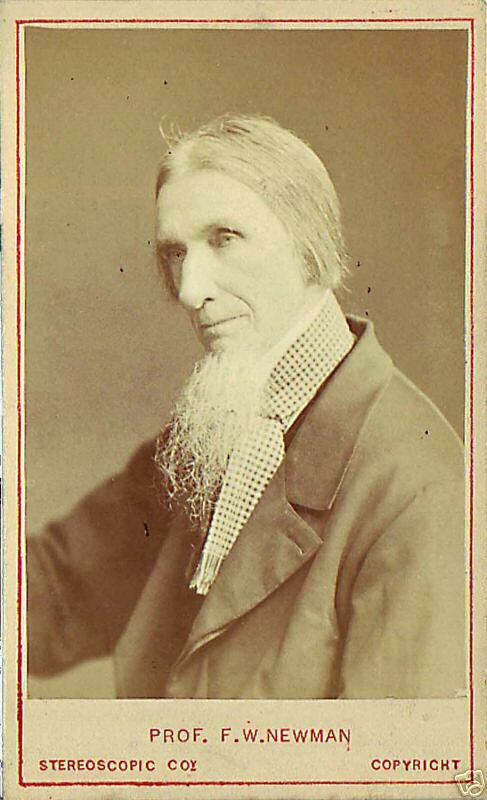 Conscientious scruples respecting the ceremony of infant baptism led him to resign his fellowship in 1830, and be went to Baghdad as assistant in the mission of Anthony Norris Groves. In 1833 he returned to England to procure additional support for the mission, but rumours of unsoundness in his views on the doctrine of eternal punishment had preceded him, and finding himself generally looked upon with suspicion, he gave up the vocation of missionary to become classical tutor in an unsectarian college at Bristol. His letters written home during the period of his mission were collected and published in 1856, and form an interesting little volume. Newman's views matured rapidly, and in 1840 he became Professor of Latin in Manchester New College, the celebrated Unitarian seminary long established at York, and the parent of Manchester College, Oxford. In 1846 he quit this appointment to become professor in University College, London, where he remained until 1869. During all this period he was assiduously carrying on his studies in mathematics and oriental languages, but wrote little until 1847, when he published anonymously a History of the Hebrew Monarchy, intended to introduce the results of German investigation in this department of Biblical criticism. In 1849 appeared The Soul, her Sorrows and Aspirations, and in 1850, Phases of Faith, or Passages from the History of my Creed, the former a tender but searching analysis of the relations of the spirit of man with the Creator; the latter a religious autobiography detailing the author's passage from Calvinism to pure theism. It is on these two books that Professor Newman's celebrity will principally rest, as in them his intense earnestness has kept him free from the eccentricity which marred most of his other writings, excepting his contributions to mathematical research and oriental philology. Generally, Newman's versatility was amazing: he wrote on logic, political economy, English reforms, Austrian politics, Roman history, diet, grammar, the most abstruse departments of mathematics, Arabic, the emendation of Greek texts, and languages as out of the way as the Berber and as obsolete as the dialect of the Iguvine inscriptions. In treating all these subjects he showed ability, but, wherever the theme allowed, an incurable crotchetiness crept in. In his numerous metrical translations from the classics, especially his version of the Iliad, he betrayed an insensibility to the ridiculous which would almost have justified the irreverent criticism of Matthew Arnold, had this been conveyed in more seemly fashion. His miscellaneous essays, some of much value, were collected in several volumes before his death. His last publication, Contributions chiefly to the Early History of Cardinal Newman (1891), was generally condemned as deficient in fraternal feeling. He was far from possessing his brother's subtlety of reasoning. His character is vividly drawn by Carlyle in his life of Sterling, of whose son Newman was guardian: a man of fine attainments, of the sharpest-cutting and most restlessly advancing intellect and of the mildest pious enthusiasm. It was his great misfortune that this enthusiasm should have been correlated, as is not unfrequently the case, with an entire insensibility to the humorous side of things. After his retirement from University College, Francis W. Newman continued to live for some years in London, subsequently removing to Clifton, and eventually to Weston-super-Mare, where he died in 1897. He had been blind for five years before his death, but retained his faculties to the last. He was twice married. T. G. Sieveking: Memoir and Letters of Francis W. Newman (1909).